Ph.D., University of California, Los Angeles, 1999; economic growth and development, macroeconomics. “Twin Transitions”, with Anna-Maria Aksan, 2013. “The Culture of Entrepreneurship,” with Jon Thompson and Etienne Yehoue, 2013. Journal of Population Economics, 26: 855-885, 2013. Economics Letters, 115(3): 338-341, 2012. – Contributions, 11(1), article 27, 2011. Pérez-Sebastián), Journal of Monetary Economics, 57(7): 859-872, 2010. 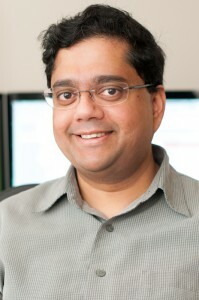 Professor Chakraborty has been calling Eugene his home since joining UO in 1999. He lives with his wife and two children in the South Hills. Having grown up in India and traveled many countries, he enjoys bringing diverse viewpoints to his research and teaching, particularly about economic development.